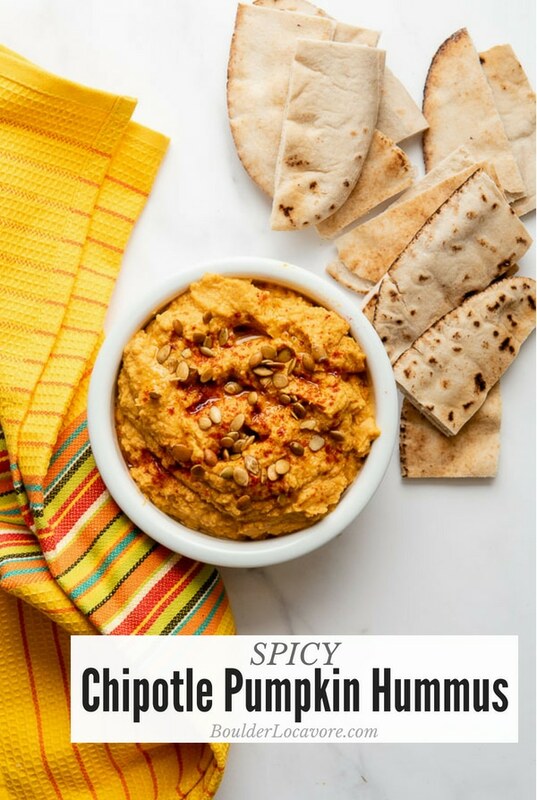 Spicy Chipotle Pumpkin Hummus - An EASY 5-Minute Recipe! Spicy Chipotle Pumpkin Hummus is a five-minute appetizer or spread full of smoky, spicy and sweet flavors. 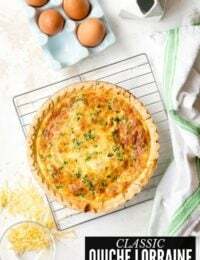 Simple wholesome ingredients and fast preparation make this a great choice for entertaining! 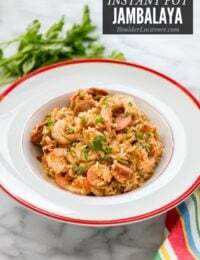 As cooler weather sets in I crave deeper flavors in food and love fast, easy recipes I can whip up in minutes. Hummus is at the top of the list. There’s only one thing that beats making hummus in five minutes; making Spicy Chipotle Pumpkin Hummus in five minutes! 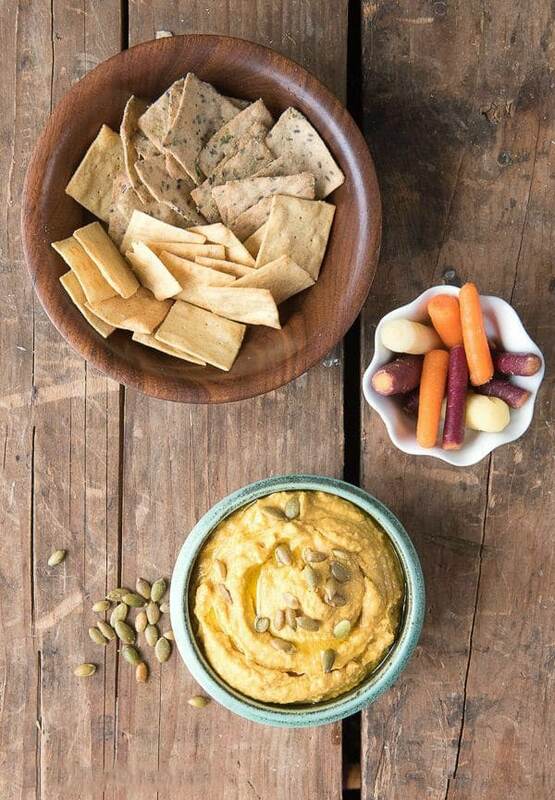 Perfect as a dip or spread, pumpkin hummus is a fall favorite full of wholesome ingredients. 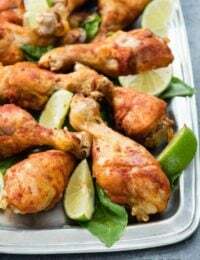 Great for entertaining (especially with drop-ins since it can be made so fast) or a great lunch box option for kids or working adults. If you haven’t tasted hummus, it’s a thick Middle Eastern dip or spread made from garbanzo beans, sesame seeds (usually in the form of a paste called tahini), lemon juice, olive oil, garlic and salt. 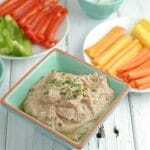 Hummus has great flavor as well as is an excellent source of vegetable protein and fiber. It’s simple to make so though readily available in grocery stores, making it from scratch is a snap! 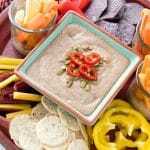 The fun thing about hummus is that is can be changed up easily to have a whole new flavor. 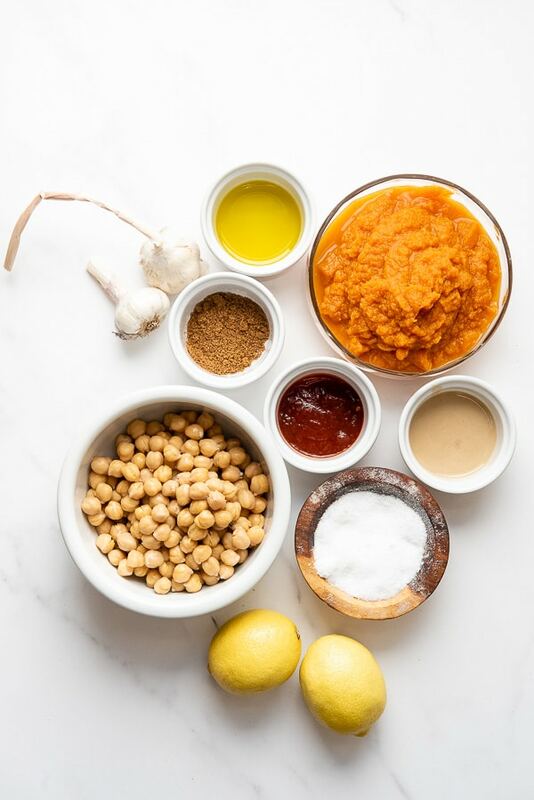 This pumpkin hummus recipe has all the standard hummus ingredients of garbanzo beans, lemon juice, olive oil, garlic, tahini and salt) as well as pumpkin puree (which you can make yourself or buy) and adobo sauce from a can of Chipotle en Adobo. NOTE for Gluten-Free diners: always check the ingredient label for chipotles en adobo as I’ve found some brands do include wheat. Adding the pumpkin and adobo sauce gives the hummus a smoky, slightly spicy, earthy flavor and gorgeous orange color. It’s perfect for fall! A dash of smoked paprika on the top and some crunchy pepitas(pumpkin seeds) finish it off. TIP: I keep pepitas in my freezer at all times so I can break out a portion when I need them and keep the rest fresh. This pumpkin hummus is not overly spicy. If you are a fan of lots of ‘heat’ feel free to bump up the amount of adobo sauce AFTER tasting it! Also those who fear the flavor of pumpkin, this pumpkin hummus doesn’t taste crazy pumpkin-y. Just enough to mesh with the smoky, spicy flavors with its natural sweetness. 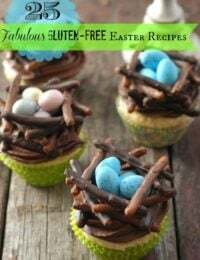 The recipe could not be easier! The garlic is diced in a food processor or blender. 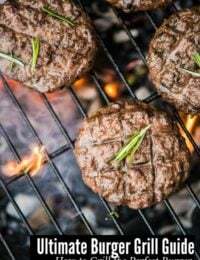 The remaining ingredients are added and pulsed to a smooth consistency! Peeling the garlic cloves are the hardest (and longest) part of preparing Spicy Chipotle Pumpkin Hummus (which let’s you know how EASY this recipe is!). AND there is a way to make that even easier and faster. A garlic peeler an inexpensive silicone tube the garlic cloves are placed inside. Pressure is placed on the tube by squeezing it down onto a hard surface (like a counter top) and rolled. This cracks the peel of the garlic clove and frees without getting your hands covered with garlic. It’s cheap, fast and easy. If you don’t care about getting garlic on your hands, use the side of a large kitchen knife and push the side of the blade down onto the garlic clove (being careful to avoid the sharp edge) to crack the peel of the garlic. Separate the peel from the garlic clove. You can also substitute a stir-in Garlic paste (available in the produce section of most grocery stores) or prepared garlic. Either of these options can be stored in the refridgerator to be ready in a moment’s notice for any recipes. The stir-in paste I use is Gourmet Garden brand which is organic and fresh in the produce department (in tubes). 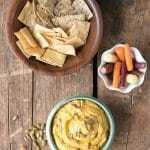 Pumpkin hummus is a fabulous spread or a dip. Add it to a sandwich for big flavors. 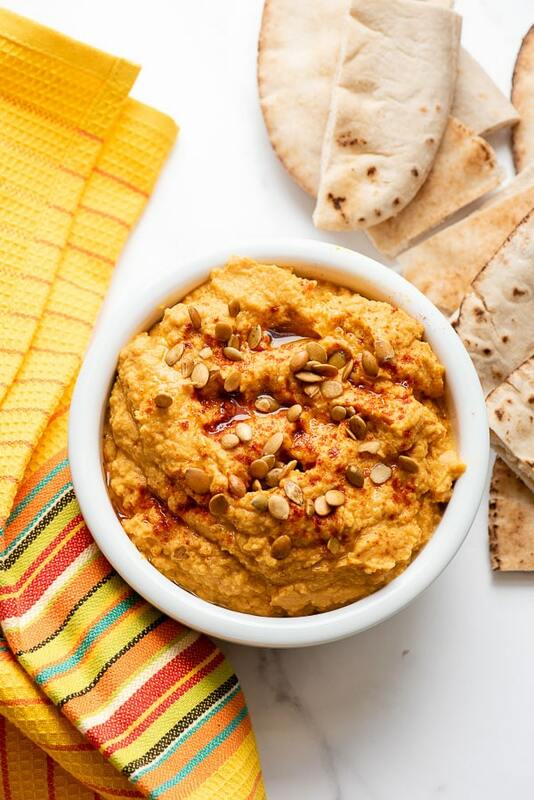 If you’ve tried this Spicy Chipotle Pumpkin Hummus recipe please RATE THE RECIPE below! 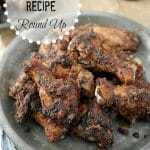 It seems silly to even call this a 'recipe' due to how easy and fast it is to make! 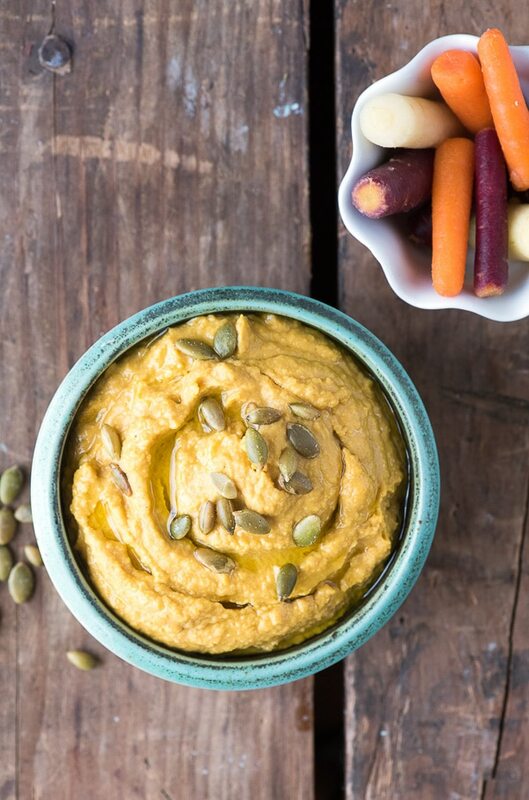 Adding pumpkin puree and Adobo sauce to traditional hummus deepens the flavors making them a bit more autumnal with a touch of smoky spice!Dipping suggestions: pita bread triangles, crackers, baby carrots, celery slices, sliced sweet peppers or other vegetable slices. Can be used as a spread on bread for sandwiches or crostini. Add the garlic cloves to the bowl of a food processor and process until minced. Add the remaining ingredients and process until the hummus is smooth. Refrigerate until serving. I can’t wait to give this one a try! 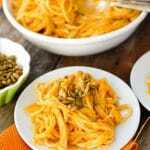 I am always looking for creative ways to use pumpkin. 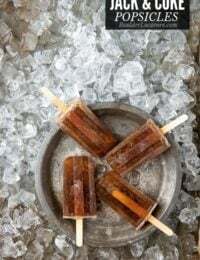 So perfect for Fall parties or just for fun! Delicious! The idea of pumpkin hummus is genius? Who knew that pumpkin and chipotle would go so well with hummus? So good! Hummus is one of my go-to snacks and this one is so good!